A brilliant new act for LIVE @ BLACK BOURTON. 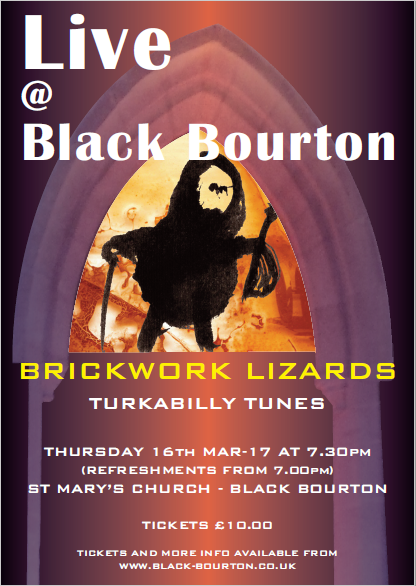 "Brickwork Lizards are Oxford purveyors of the finest Turkabilly gyp-hop mashup, since 2005. We call it Turkabilly, as there’s no easy way of describing the music we play. It combines Arab folk tunes, 1930s jazz, vaudeville, rap and hip hop. You might also hear elements of delta blues, mariachi or gypsy music. We’re equally at ease playing high-octane rock gigs and in more intimate acoustic settings. Our music is fun but thought-provoking, pure but simple. Have a listen to some of our tunes to find out what we mean." Doors open at 7.00pm where you'll find a range of refreshments including wine and soft drinks. To purchase tickets please visit: www.black-bourton.co.uk or email us on: BBVA1@Hotmail.co.uk. Black Bourton is a small well kept village close to Cotswold Wildlife Park. The village is steeped in history with its own church built in the 12th century. The village is surrounded by many little Cotswold villages, a small social community of 110 dwellings and less than 300 people. The old railway bridge and disused lines running to neighbouring Bampton can still be seen today. Black Bourton has a close relationship with RAF Brize Norton that puts us on the map. The village amenities consist of a public house and a shared community village hall with nearby Alvescot. Black Bourton has its own recreational park with tennis court. Being very close to Bampton boosts its array of amenities meaning you are never far from essentials. The Shillbrook runs for three miles through the village, eventually feeding into the Thames. The luxury of this brook brings an abundance of wildlife and nature from kingfishers, to herons to water voles. Welcome to our website. Browse, blog, email your comments or join us at the BBVA.